A UN-commissioned report established that Israel has imposed a system of apartheid on the entire Palestinian people and called for BDS measures to end this apartheid regime. South Africa again gave the world a lesson in how to concretely resist injustice when its ruling African National Congress (ANC) unanimously voted, at its general conference, for downgrading South Africa’s diplomatic ties with Israel. The 25,000 strong Democratic Socialists of America declared its full support for the Palestinian struggle and endorsed the BDS movement. The Spanish parliament affirmed that the right to advocate for Palestinian rights through BDS is protected under freedom of speech and association. Hundreds of elected officials in the Spanish state endorsed BDS for Palestinian rights. The UK government was defeated in court by the Palestine Solidarity Campaign and its allies in a ruling that deems it unlawful for the government to restrict the right of local authorities to divest from companies complicit in Israel’s violations of Palestinian human rights. The Swiss parliament blocked Israel lobby efforts to criminalize support for BDS. Six National Football League (NFL) players in the United States turned down an Israeli government-sponsored, all-expenses paid, propaganda trip organized to improve Israel’s fast deteriorating image. 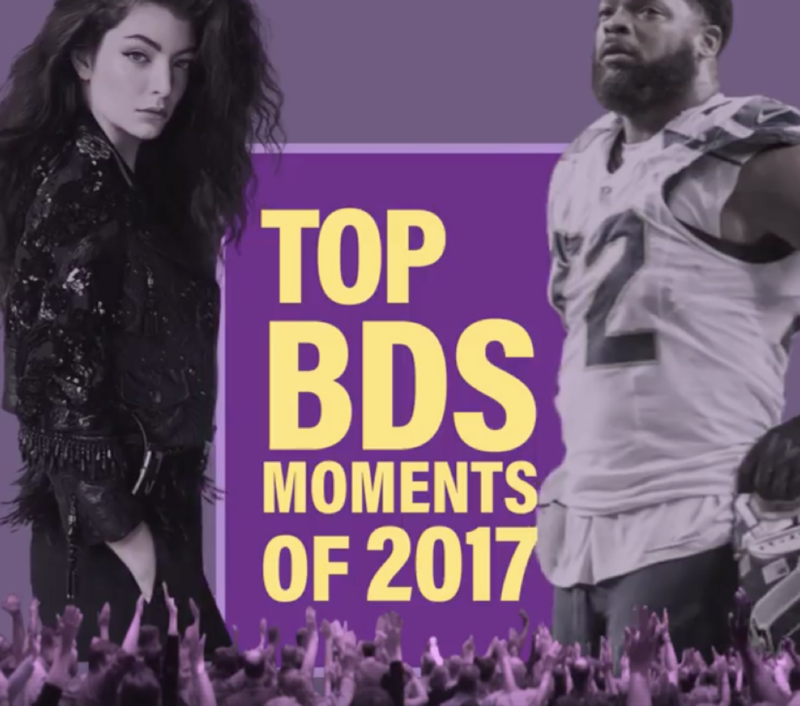 Grammy-award winning artist Lorde canceled her concert in Tel Aviv, and so did rapper and young feminist icon Princess Nokia (Destiny Nicole Frasqueri), following calls from BDS activists to respect the Palestinian picket line. More than 100 prominent artists wrote in support of Lorde’s right to follow her conscience and exercise her right to boycott. Wave of boycotts hit Israeli LGBT film festival & showed growing respect for Palestinian BDS picket line. Nine musical acts withdrew from the Pop-Kultur festival in Berlin after supporters of Palestinian rights highlighted that the festival violated the Palestinian BDS picket line. Prominent Portugues photographers launch a pledge to refuse professional invitations or financing from Israel and to refuse to collaborate with Israeli cultural institutions until Israel "complies with international law and respects the human rights of Palestinians." The South African Council of Churches (SACC) and the Council of African Independent Churches (CAIC), representing more than a million Christians in South Africa, announced their support for the Palestinian struggle and the BDS movement. The Mennonite Church USA voted by an overwhelming 98% majority to divest from companies that profit from the Israeli occupation, following several mainline churches that adopted similar policies in recent years, including the Presbyterian Church USA, the United Church of Christ and the United Methodist Church. Twenty-three US churches have declared themselves HP-free after calls from Palestinian Christians to boycott the company for its complicity in Israel’s violations of Palestinian human rights. Norway’s largest trade union federation, LO, representing close to a million workers, endorsed a full boycott of Israel to achieve Palestinian rights under international law. A 16 million-strong national farmers’ union in India, the All India Kisan Sabha (AIKS), joined the BDS movement. The largest Canadian workers’ union in the private sector (Unifor), representing more than 310,000 members, endorsed the right to boycott and to deploy BDS tactics to end Israeli military occupation. BDS Gulf held its first regional anti-normalization conference in Kuwait City, with a broad participation of speakers, organizations, activists and political figures from the entire Arab Gulf region. Major Colombian social movements, organizations and unions joined the BDS movement and called for parallel support for their own struggle for freedom and human rights. More than 200 Latin American organizations, coalitions, social movements and personalities published a letter addressed to the Board of Directors of the Mexican multinational company Cemex, calling on its members to end the company’s complicity in Israel’s human rights violations in the Occupied Palestinian Territory. Their efforts are part of a growing #StopCemex campaign. G4S, the world's largest security company, suffered more losses around the world due to its ongoing complicity in Israeli crimes. UN Women became the fifth UN agency in Jordan to drop its contracts with G4S following a campaign by BDS activists there, and seven private and public companies in Jordan discontinued their service contracts with G4S. The Lebanese doctors’ syndicate dropped G4S, following a campaign by boycott activists in Lebanon. G4S also suffered its first loss in Ecuador, where a research institute dropped its contract with the company following a BDS campaign. A California transportation board dropped its contract with G4S after a human rights and labor coalition, including BDS activists, highlighted the company’s role in violating human rights in Palestine and the United States. Denmark's third largest pension fund “Sampension” excluded four banks and companies from its portfolio, citing their investments in illegal Israeli settlements.They were identified as two Israeli banks, Hapoalim and Leumi, the German construction company HeidelbergCement, and Bezeq, Israel’s largest telecommunications company, which owns telecommunications equipment installed within settlements. Israel’s largest public transportation operator “Egged” lost a 190 million euro contract to run public transportation in the Netherlands. Air Canada ended a maintenance contract worth tens of millions of dollars with the Israeli arms firm “Israel Aerospace Industries” two years before the contract’s end date. One of the largest aeromedical organizations in the world, Australia’s Royal Flying Doctors (RFDS), refused services from the Israeli military and tech company Elbit Systems. Elbit Systems produces 85% of the drones used by the Israeli military, including those used to attack Palestinian civilians in Gaza from 2009 to 2014. South Africa’s largest residential university, Tshwane University of Technology (TUT), with over 60,000 students, endorsed the academic boycott of Israel. Two Chilean universities cancelled events sponsored by the Israeli embassy. Also, medical students at Chile’s largest university voted to break institutional ties with Israeli universities. Seven US student governments voted to divest from companies profiting off Israeli occupation. These include Tufts University, the University of Michigan, California State University at Long Beach, De Anza College, Pitzer College, University of South Florida, University of Wisconsin-Madison. The prestigious Catholic University of Leuven in Belgium announced its withdrawal from LAW TRAIN, a complicit EU-funded research cooperation project with the Israeli police and the Israeli Ministry of Public Security. This withdrawal follows an earlier high-profile withdrawal of support by the Portuguese Justice Ministry.